Chinese President Xi Jinping met with Nepalese President Ram Baran Yadav during the 2015 Boao Forum for Asia (BFA) in South China’s Hainan Province on Saturday, welcoming Nepal to participate in the Belt and Road cooperation. 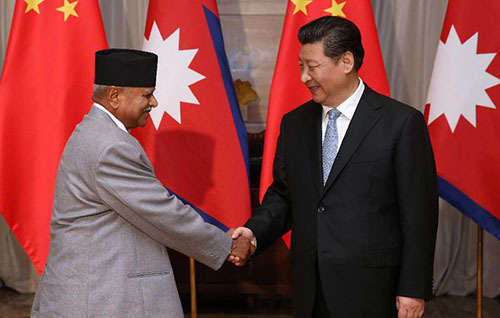 Welcoming Yadav to the annual conference, Xi said China-Nepal relationship is a model of peaceful coexistence and mutually beneficial cooperation between big and small countries. We cherish the traditional friendship with Nepal, said Xi, adding that China is willing to be Nepal’s good friend of mutual respect and mutual support, good partner of common development and common prosperity and good neighbor of mutual assistance in security. As this year marks the 60th anniversary of the establishment of China-Nepal diplomatic ties, Xi called on the two sides to be well prepared for a series of commemorative activities. He suggested the two countries should strengthen cooperation in traffic interconnectivity, infrastructure, hydropower development, modernization of agriculture, science and technology. China is willing to initiate the negotiations on Free Trade Agreement with Nepal at an early date, he said, also calling on the two sides to enhance law-enforcement and security cooperation. China appreciates Nepal’s firm support on issues concerning China’s core interests, including issues related to Tibet and Taiwan, said the president. China will continue to support Nepal’s effort in safeguarding independence, sovereignty and territorial integrity, he added. Xi voiced the hope that Nepal would not allow any forces to use Nepal’s territory to engage in anti-China separatist activities. He also called on the two sides to beef up cooperation in the areas of youth exchanges and tourism and enhance coordination on multilateral occasions to safeguard their common interests. Yadav said Nepal would never allow its territory to be used by any anti-China activities. Nepal supports China’s initiatives of jointly building the Silk Road Economic Belt and 21st-Century Maritime Silk Road as well as the Asian Infrastructure Investment Bank (AIIB), said Yadav. Nepal calls for strengthened cooperation between the South Asian Association of Regional Cooperation (SAARC) and China, in a bid to promote regional interconnectivity and economic development, he said. Nepal appreciates China’s important and positive role in international affairs and hopes to enhance cooperation with China, he added.